How do I use Audiobit Music Player? If you’ve changed your mind and decided you wanted to listen to a different album, just tap the folder name in the upper-left corner of the screen of the phone and that will take you back to the parent folder. You can also tap and hold the name of the folder in the upper-left corner to display the list of the parent folders, from which you can choose a folder to go back to. When one track is finished, it will start playing the next one in this list. Or, you can play another track by tapping on its file name. You can also use the buttons at the bottom of the screen to pause, resume playing, or to play the next or the previous track, if you want. This screen shows the file name of the track that’s currently playing, as well as the name of the folder it belongs to. If you want to play tracks from a different folder, then unlock the phone, return to the Audiobit app, and tap the Home button in the top-right corner of the screen. Then navigate to the folder you want to play, and tap a track in that folder to start playing it. This will remove the tracks that previously were in the paying queue and add the tracks from the current folder to the queue instead. Which options of Audiobit can I change? Turn the Resume playing on launch option on and off. If this option is on, then whenever you start or resume Audiobit app, it would automatically resume playing the last track that was playing when Audiobit app was suspended or turned off. If this option is off, you would need to press the Play button to resume playing the track manually. Turn the Show album art if available option on and off. 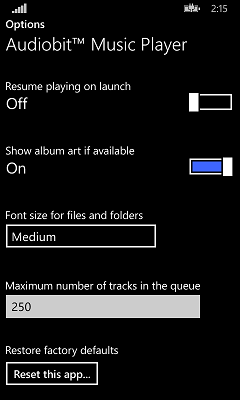 If this option is on, then Audiobit would display the album art image above the list of tracks, if such an image is present (and is not set to be hidden) in the folder. If this option is off, then Audiobit would not display the album art, even of the images are available. Change the Font size for files and folders. You can choose between the small, medium, and large font options. Restore factory defaults. You can use this option to erase any changes you might have made to the Audiobit app and restore it in the original state, as it was after you first installed the app. Can I exit the Audiobit app if I want to stop listening to music? Although generally it is not necessary to exit the app: it’s sufficient to just pause the track and that would stop the music. What about random playing, playlists, etc? Such commands (and more) available as an optional premium package that you can purchase in the Windows Store. Can it play the FLAC files? Nice app! Playing by folder is the best of all. What type of music formats can it play? I really like your audio player above all others I have tried. I would like to suggest the addition of one other option. Can you add the option of being able to play one track at time instead of all the tracks in an album automatically one after the other? Add playlist feature.. That would make this the perfect Windows player. Hello, i was using this player unter winphone 8.1 with no problems. And it is my favorit! Simple to use – nice work! 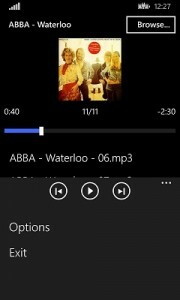 Now after the update on Winphone 10 the player stops after endet a song while the lockscreen is avtive. it continues when i open the lockscreen…..
Peter Wolf and others who experience the problem with random stops after upgrading to WP10: please update Audiobit to the new version 1.1.0.15, it should solve this problem. Love the app. So Easy. BUT can we have an option to allow auto follow on to the next folder. Playlist option would be lovely too. i would like to suggest another feature. It would be great if would start over from the beginning when the last song of the folder finishes. This could be used as a repeat – option as well. You just add a new folder with the one or two songs you want to haved played repeatly. can i play music from an external networked harddrive (as long as i’m on that network, of course), in my case WD NAS? @John: unfortunately, it’s only possible to play files from the phone or the SD card, sorry. 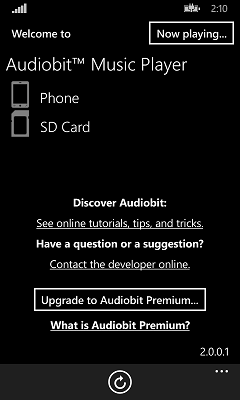 I just installed Audiobit, but when punching up any of the audio folders on my SD card, all that pops onto the screen is “No audio files here”. Of course, none of the files, or songs, even displays either. If I don’t see a quick solution in the next day, I will uninstall yet another player from my Lumia 530. @Greenjeans: please make sure that the audio files are in one of the supported formats (such as MP3). If the files are in an unsupported format, they are not displayed. directory. Do not place them in the hidden sub folders such as Album, Artist, and Playlist folders. AudioBit does not search in these sub folders. What is eight minus 6 ?